The Court does not have designated parking reserved for jurors. You will be responsible for your initial parking costs when appearing for jury service; however, you will be paid $8.00 per day for parking costs. Some lots vary from $6.00 to $15.00 a day. You may want to come early and shop around for the best parking rates. Be sure to pay for an entire day's worth of parking because you may be required to be at the Court all day. Do not park at any parking meters as you will not be able to leave the courtroom in order to feed your meter. If you are not familiar with the downtown area, please give yourself additional time to find a parking lot, park your vehicle, pay the parking fee and walk to the courthouse. This link will take you to a map showing some of the available parking areas in Salt Lake City. There is a large public parking lot immediately south of the Courthouse on 400 South, between Main and West Temple. The fee as of Dec. 2018 is $8 for all-day parking. The kiosks with the credit card readers are at the North and West entrances. Jurors are encouraged to use public transportation when possible. Jurors arriving from within the Salt Lake Valley may easily utilize the UTA TRAX light rail system. 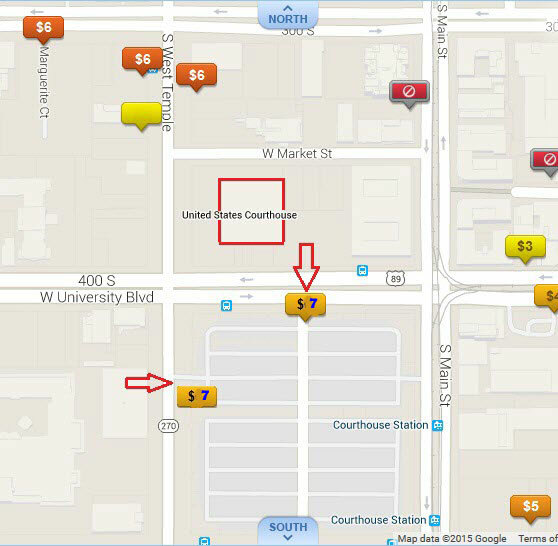 The courthouse is located between the Courthouse Station and the Gallivan Center stops. Using public transportation will help you eliminate parking problems.